Belgian commemorative stamp issue Belgian Post issued two postage stamps and a souvenir sheet on 9 June 2014 to mark the International Year of Crystallography. 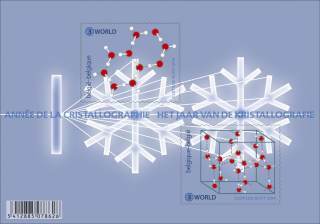 Stamps and sheet are designed by Clothilde Olyff, in a joint issue with Pošta Slovenije, and show snowflakes, a diffraction experiment and the arrangement of water molecules in ice crystals. Belgium: Crystal Growing Competition Nationwide During a period of 4 weeks children from secondary schools have to grow single crystals. The competition is organized by the Belgian National Committee for Crystallography and sponsored by the Royal Academy and Acros Organics.